Men (and sometimes women) always raced horses (or chariots, as the Celts did) ... so the origins are definitely lost in the mists of time. But we know more about modern winners: Today, horses competing in racing are thoroughbreds, many of whom can be traced back to just three Arabian stallions, imported into England during the early 18th century. It is a family affair, so to say. Thoroughbreds from Ireland are sought after worldwide and can command a high price. County Kildare is literally dotted with studs, including the Irish National Stud. There are just two basic types of races and most racecourses (but not all) cater for both. This is about speed and stamina - races run over distances ranging from five furlongs (1,000 meters) to twenty furlongs (4,000 meters). The horses are starting from stalls. There are no obstacles on the course. Flat racing season starts in mid-March and ends in mid-December. The "home" of flat racing is the Curragh of Kildare. Horses used in flat racing start running as two- or three-year-olds. National hunt races are run over at least two miles (about 3,200 meters) and here horses will have to jump (or, very occasionally, scramble through) a number of obstacles. Races are started from a tape barrier in a slightly haphazard fashion. National hunt racing is on offer on all the year, the main season running from November until late April. Horses in the National Hunt competitions are at least four- to five-year-olds. Some horses progress here from flat racing as they get older. Hurdles - run over regular obstacles measuring about a meter in height. Point to Point - a "back to nature"-event run over fences on farmland the spring and autumn. Very rustic, often very muddy, quite exciting to watch. Steeplechase - run over fences of varying size. Steeplechase was "invented" in 1752 when Edmund Blake and Cornelius O'Callaghan wanted to find out whose horse was faster (they were both keen horsemen and liked a bet). They held a race across County Cork between the steeples of the churches in Buttevant and Doneraile. Cross-country. What's in a Race Title? Bumper - here it already gets confusing, because these are special flat races for young jump horses, hence the contradictory term "National Hunt Flat Races". You'll find mostly amateur jockeys braving the distance of up to 4,000 meters. 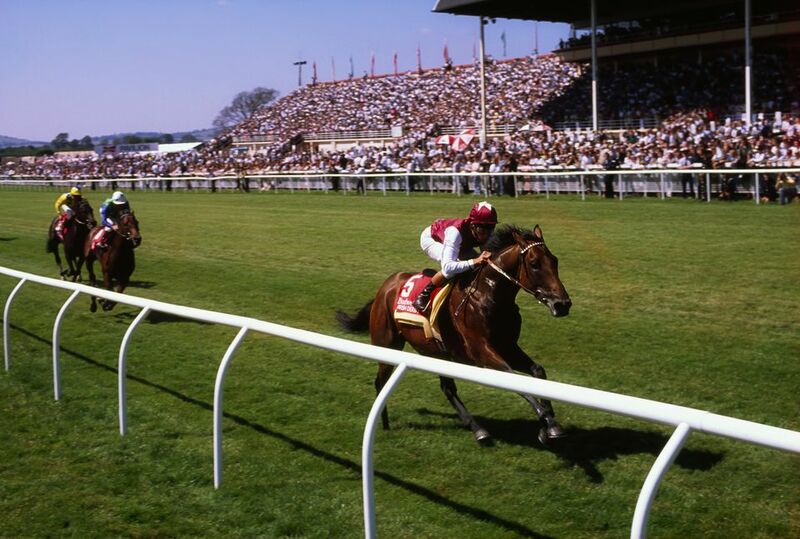 Classics - the common term for the highest quality flat races in Group 1 (see below), all run on the Curragh: the Irish 2000 and 1000 Guineas, the Derby, the Oaks, and the St. Leger all run at the Curragh. Conditions race - a race rated below "Listed" standard (see below) with conditions for qualification. Group 1, 2 or 3 - the "valuable races" (Group 1 topmost), weights carried are the same for all horses. Handicap - a race where horses carry weights, the exact amount determined by the "Official Handicapper" based on the horses' perceived ability. Highest rated horses carry more weight, their less rated colleagues get off lighter. In theory, all horses should thus have an equal chance of winning. Listed - races that are "just below" Group 3 (see above) standard, weights are allocated according to the horse's age. Maiden - a race open only to horses that never won a (professional) race before. Novice - hurdles and steeplechases for horses that did not win these races in previous seasons. A horse that has a steeplechase the season before may, however, run in a novice hurdles race (or vice versa). Nursery - a handicap race for two-year-olds only. And Finally - How to Dress? To be honest, horse racing in Ireland is a fairly informal affair and you will see those dressed to the nines rubbing shoulders with farmers in wellies. One exception would be "Ladies' Day" when women of all ages put on their most elegant, extravagant or eye-catching ensemble. And if looks could kill, you would not want to pass between two female visitors on these days. What: Three days of flat and jump racing in Mallow, running over the long Easter weekend. Cork is often regarded as the “home” of National Hunt racing due to its historic associations with the sport. The event is often eclipsed by the Fairyhouse Grand National, however. What: The Fairyhouse Easter Festival is the focus of most punters' attention every spring and crowds roll in from Dublin. The racing here was, in fact, responsible for some of the early successes of the Easter Rising in 1916 – as many British officers had opted to spend their Easter Monday here. What: Punchestown Racecourse is one of the main venues for National Hunt racing in Ireland and hosts nearly twenty race meetings throughout the year, every year. The undisputed highlight is the Irish National Hunt Festival in April, five days of racing in a row. What: The Derby Festival is one of Ireland's top sporting and social events of the calendar, complete with glamour, family fun, and also a bit of racing from some of Europe's top horses. After all, they are after the biggest prize in Irish racing! What: A festival running for three days, devoted to evening racing and often used to chill out from the Curragh Derby. What: This festival at the stunning Killarney Racecourse can be described as the main event of Killarney's racing calendar, complete with an entertaining mix of flat and national hunt racing over five days. Very popular with the holiday crowd, come early! What: The Galway Festival is regarded as one of the most important events of the summer season and boasts a full week of top-class racing and entertainment. Cue traffic chaos. For long periods the festival was also (in)famous for the informal networking in the Fianna Fail tent, where politicians and (selected parts of) the public could mingle. What: A festival running over four days with three evening meetings in one of the most popular vacation spots in the South-East of Ireland: Expect huge crowds and a generally relaxed, family-friendly atmosphere. What: Famous for racing during late summer evenings on the Hill of Crockafatha, a unique experience to round off the summer (well, if there was one). Two days only. What: Four days of evening racing on Killarney Racecourse mark the end of the summer season in the busy south-western resort. More relaxed than the earlier festival, but still drawing a good crowd. What: Seven days of racing make up the last major festival of the summer season. Very popular with the rural community and pre-booking accommodation is definitely advisable. What: Generally regarded as a showcase event for the cream of National Hunt racing, Down Royal in November is the place where experts meet. What: One highlight of this festival is the Grade 1 hurdle race, regarded as an early season trial and indicator for the Champion Hurdle at Cheltenham (England) – traditionally an “adopted” Irish event. What: An early highlight of the National Hunt season, often regarded as the beginning of the winter racing proper. Very popular with the festive Dublin crowd. What: After the turkey is eaten and the presents are given, it is time for some excitement outside the home – the Leopardstown Christmas Festival is regarded as a good day out for everyone. What: Another great Christmas festival of racing, mainly drawing the crowds from the West of Ireland. What races are run at Ballinrobe? About two kilometers outside the town of Ballinrobe. What races are run at Bellewstown? Just off the main Dublin to Belfast road (N1), signposted. What races are run at Clonmel? About two kilometers from Clonmel town center, just off the Waterford to Limerick road. What races are run at Cork? One and a half kilometers from Mallow town on the Killarney Road (N72). What races are run at the Curragh? Right on the Curragh plain, three kilometers from Newbridge. What races are run at Down Royal? The course is located about four kilometers from the town of Lisburn. What races are run at Downpatrick? Just two kilometers from the center of Downpatrick. What races are run at Dundalk? About one kilometer outside Dundalk town center, heading north – this track was Ireland's first floodlit all-weather horse racing venue. What races are run at Fairyhouse? Near the village of Ratoath, well signposted off the M2 and M3. What races are run at Galway? Six kilometers outside Galway City, off the Tuam Road. What races are run at Gowran Park? A kilometer outside the village of Gowran, right next to the Dublin-Waterford road (N10). What races are run at Kilbeggan? Around one to two kilometers from Kilbeggan town. What races are run at Killarney? Just a kilometer outside Killarney town, on the road to Kenmare. What races are run at Laytown? Actually, there is no racecourse: Laytown is a small seaside resort and hosts the only officially approved beach racing event in Europe. So, just head towards the beaches (and follow the signs). What races are run at Leopardstown? In Foxrock (Dublin 18), about six kilometers south of Dublin City center. Well signposted. What races are run at Limerick? At Greenmount Park in the townland of Patrickswell off the M20, about eight kilometers south-west of Limerick City on the M20. What races are run at Listowel? What races are run at Naas? About a kilometer outside Naas town center – but do not follow the signs for Punchestown (see below). What races are run at Navan? About three kilometers outside Navan town, on the Kingscourt Road (R162). What races are run at Punchestown? About five kilometers from Naas on the Naas-Ballymore Eustace Road. It is signposted from Naas, but take care to avoid confusion with Naas Racecourse (see above). What races are run at Roscommon? Just outside Roscommon town on the Dublin-Castlebar Road. What races are run at Sligo? Cleveragh is just a kilometer from Sligo town center, off of the Pearse Road. What races are run at Thurles? Just over a kilometer west of Thurles town, west of the main Cork-Dublin road. What races are run at Tipperary? Three kilometers west of Tipperary town, on the Limerick road. What races are run at Tramore? Just outside the town of Tramore, about 13 kilometers from Waterford. What races are run at Wexford? Just outside Wexford town, off the Dublin-Rosslare bypass.